The writer feels that the children are freeloaders, sent to our care by parents who are not taking responsibility for their own children. It’s their responsibility, not ours! “Where are their parents?” he asks. 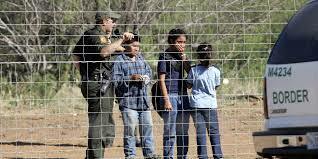 But maybe we are responsible—very responsible for the plight of these children and their parents. 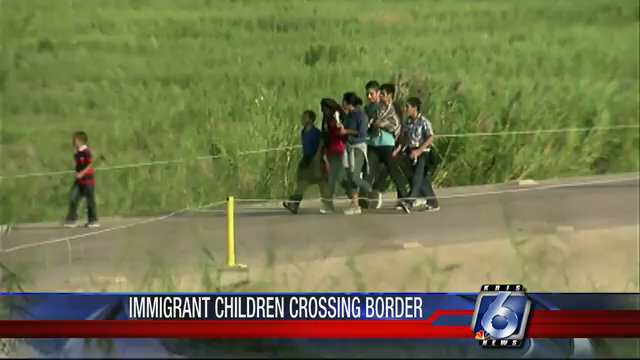 Is it not the U.S. drug laws, and the widespread willingness of Americans to break them, that have created the incredibly lucrative illegal drug market, motivating and funding the gang violence that drives Central American parents to send their children to our borders? And is it not our guns, bought in U.S. gun shops and shipped to Central America, that makes the gang violence so lethal? And maybe it is also a lack of attention by our society, thinking that poverty rates of 65% in Honduras, 75% in Guatemala, and 40% in El Salvador will somehow not spill over to our borders–and thinking that Central American governments, run by tiny, sometimes even uncaring elites, facing the threats of drug gang guns and the temptations of drug gang money (both originating in the U.S.), can turn the tide without our help. We have been studying Levels of Analysis (Kenneth Waltz, Graham Allison) in our course, and MS. MERCEDES GUERRERO had this to say about the Reagan administration’s handling of the Grenada “crisis” that year. 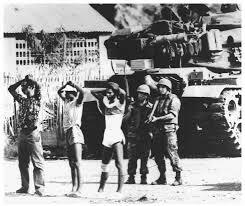 Grenada, Small Island of 91,000 in population close to Venezuela in the Caribbean, was invaded by the United States in 1983. The reason for the invasion was that the 3 years prior to that a revolutionary group of Venezuelan and Cuban overthrew the government, establishing a revolutionary government. The Countries of Barbados and Jamaica allied with the Organization of the Eastern Caribbean States organized and made a request for assistance to Ronald Reagan, the president of the United States at that time, which had decided to take military action. The military action took place because allegedly there was a group of American medical students held hostage by the local revolutionary government and the invasion was requested through a diplomatic channel. The US Official cited the murder of the imposed Maurice Bishop. 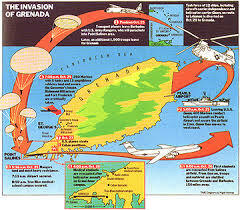 The international press criticized the decision of the invasion to Grenada, this being a free country that it can take care its own problems. The United States violated several treaties and conventions to which it was a party. For example, Margaret Thatcher, British Prime Minister sent a message to President Ronald Reagan to consider his decision and cancel the order to landing in Grenada. When she told him that, he had already begun to do so. Also, A group of democratic senators restrained to vote in favor of his decision, but he made his own decision to do so. The chaos came after that, because they did not know who to blame for it. The New York Times said that “the Analysis by the U.S. Department of Defense showed a need for improved communications and coordination between the branches of the U.S. forces.” Who is the commander in chief at that time? Ronald Reagan. Reasons for his decision were not really the American Students. The reason for that decision was the need to eradicate a possible growing community of revolutionary in this area, next to Cuba as an allied, the support of the Britain, Libya and Algeria. It was the construction of an international airport too big to the necessity of such a small country, what they alleged it was for the tourism demand in the Island. Reagan saw the possibility it would enhance the Soviet and Cuban transportation of weapon to Central American insurgents and expand Soviet regional influence. It was the Wishful thinking of the President Reagan to control of the propagation of the communism in the Caribbean and Latin America. By the same talking, the decision-making coming from the Commander in Chief, President Ronald Reagan to invade Grenada it was nothing more the fear of the exposition of the Cuban influence and the Soviet Union in the Caribbean community, so close to its beach and sea delimitations that could fulfill the ideas to continue fabricating missiles, and therefore the easiness of the transportation of those weapons throughout our barriers. By restraining this type of revolutionary governments in Latin America United States was trying to restrain the communism in our area. We can see that was the glorious era of the imposition of the United States, with his power to control the expansion of said doctrine in our society, making the Yankee imperialism more realist than ever. It was imposing its power all around the world. People in some of the world’s poorest countries are being deprived of one trillion dollars every year. Criminals are secretly siphoning off cash through money laundering, tax evasion and embezzlement. Not just a little cash. One trillion dollars. We’re not talking about international aid, which is making a real and tangible difference, but money taken from developing countries’ own budgets and economies. Imagine what just a fraction of that money could do if it was invested in helping families lift themselves out of poverty for good. This is a Trillion Dollar Scandal and it’s up to us to tell world leaders to stop it. In just a few weeks, finance ministers from the world’s 20 most powerful countries are meeting in Australia. They’ve got the power to help put an end to these deals – but only if we make this scandal impossible to ignore. Tweet or send a message to US Treasury Secretary Jack Lew right now and tell him it’s time for the world’s poorest to get their $1,000,000,000,000 back. It might seem like there’s nothing you can do to help. But if this issue is on the finance ministers’ agenda when they meet, we could see our leaders commit to some powerful new rules. So here’s the plan: Tweet our finance ministers – including US Treasury Secretary Jack Lew. And we won’t send just a couple of tweets, but thousands for all the world to see. Urge them to make history and end this Trillion Dollar Scandal. That’s only phase one – we’ll have more ideas to get leaders to act, so stay tuned. It’s time to help the world’s poorest people get their trillion dollars back. and malnutrition. That’s 1 Vietnam (all statistics are American-only comparisons) very week , 1 World War I in 1.2 years, 1 World War II, every 3 years. These are people in Africa and Asia mainly, often civil war refugees, esp. in Africa now. This does not include any Other disease (AIDS, malaria, polio, tropical diseases). To nourish most of these people through NGO’s (you should know the term) and government aid would cost about $300 billion per year. The U.S. defense budget is $700 billion, it’s federal budget 4 TRILLION $. Europe and Japan together spend more than that. So do the math: $300 bil. to save over 15 million lives annually out of budgets of 9 Trillion (9,000,000,000,000). Americans spend several hundred billion annually on cosmetics, beer, and cappuccino’s (see the prices at Starbucks). That’s 20 million humans mostly under 10 yrs. or over 60 yrs. old, annually. nd malnutrition. That’s 1 Vietnam (all statistics are American-only comparisons) very week , 1 World War I in 1.2 years, 1 World War II, every 3 years. These are people in Africa and Asia mainly, often civil war refugees, esp. in Africa now. This does not include any Other disease (AIDS, malaria, polio, tropical diseases). To nourish most of these people through NGO’s (you should know the term) and government aid would cost about $300 billion per year. The U.S. defense budget is $700 billion, its federal budget 4 TRILLION $. Europe and Japan together spend more than that. So do the math: $300 bil. to save over 15 million lives annually out of budgets of 9 Trillion (9,000,000,000,000).